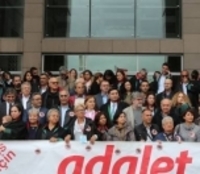 The Justice Watch, which has been held every week in front of the İstanbul Courthouse in Çağlayan in solidarity with the arrested lawyers, was held for the 74th time today (October 11). The Saturday Mothers/People, Confederation of Progressive Trade Unions of Turkey (DİSK) Press Union (Basın-İş) Chair Faruk Eren and MPs of the Republican People's Party (CHP) Sezgin Tanrıkulu and Aykut Erdoğdu attended the 74th Justice Watch. "My brother entered the Gayrettepe Police Station 38 years ago and did not leave it again. Just like Jamal Khashoggi... Just as President Erdoğan has said, 'What happened to Jamal Khashoggi', we have also been asking what happened to our loved ones for the last 38 years. "We could not find justice in justice palaces"
"It has become a crime to ask questions about the fates of our loved ones. The Galatasaray Square has become a crime and it has been banned. We were in Galatasaray because we could not find justice in justice palaces. We wish that they had heard us so that we would not sit there. "We are calling the government to take a step to reveal what happened to our loved ones and to put the perpetrators on trial. Making statements for the press is a right of ours. Violating this right is a crime as well. We will never give up. We will be insistent on making our voices heard in Galatasaray."